BEFORE: My Media Criticism class is the sponsor for today’s film, Blade Runner. I watched this film one or two years back so I’m already familiar with the film although I’m looking forward to watching it again. Blade Runner is one of those films that a lot of people love and view it as a top film in the science fiction genre. (Forrest Gump is another film that most people like and I don’t. That film is also on my rewatch list.) I however did not find it entertaining at all in my first viewing. Ridley Scott’s vision of the future is breathtaking but I found everything else to be boring and uninteresting. I wonder if this second viewing will change my opinion of the film given my prior knowledge from the first go-round. AFTER: Blade Runner was a bit more enjoyable the second time through but it still doesn’t live up to the level that fans place it at. 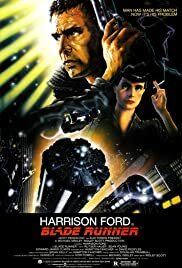 As I said in the before section, I thought Ridley Scott did a fantastic job with the production design of a dystopic future society where technology has led the Earth into a drab and dreary looking world. The sets, costumes, props; everything you see in Blade Runner looks fantastic. That is one thing that has not changed since my first viewing. What has changed is my understanding of the story. I did watch the Director’s (Final) Cut edition both times (my class had a big discussion about why not to watch the Theatrical Release version - based on their comments I can tell you definitely watch the Final Cut) but I enjoyed the story more the second time. This is probably because I wasn’t focusing on everything going on in the frame. I could pay less attention to the beautiful visuals and more so to the characters, their actions, and the story being told. By looking at the film this way, it’s still the same story, but it makes a lot more sense now than it did before. But my biggest complaint still remains from the first viewing and that is focus. I said in the first viewing I spent most of my time looking at the visuals and not paying attention to the story. The reason being is I feel that was Scott’s intent. Much like last night’s The Panic in Needle Park, the focus was not placed on the story, but rather another element. For Needle Park it was drug use and for Blade Runner it is the vision of the future. Because of this, the film seems unnecessarily long and drawn out and at many times, boring despite a lot happening on the screen. Blade Runner is still not my favorite film nor do I think it ever will be. But I am glad I have seen it and seen it twice. This second viewing has given me a new appreciation for the film and its story. I would highly recommend watching it but I will stipulate that you’ll need to want to sit down and watch this. Blade Runner is not a spur-of-the-moment type film but a thoughtful and contemplative film.